This is a very easy recipe for rather impressive looking meringues. Crispy exterior and marshmallow interior. 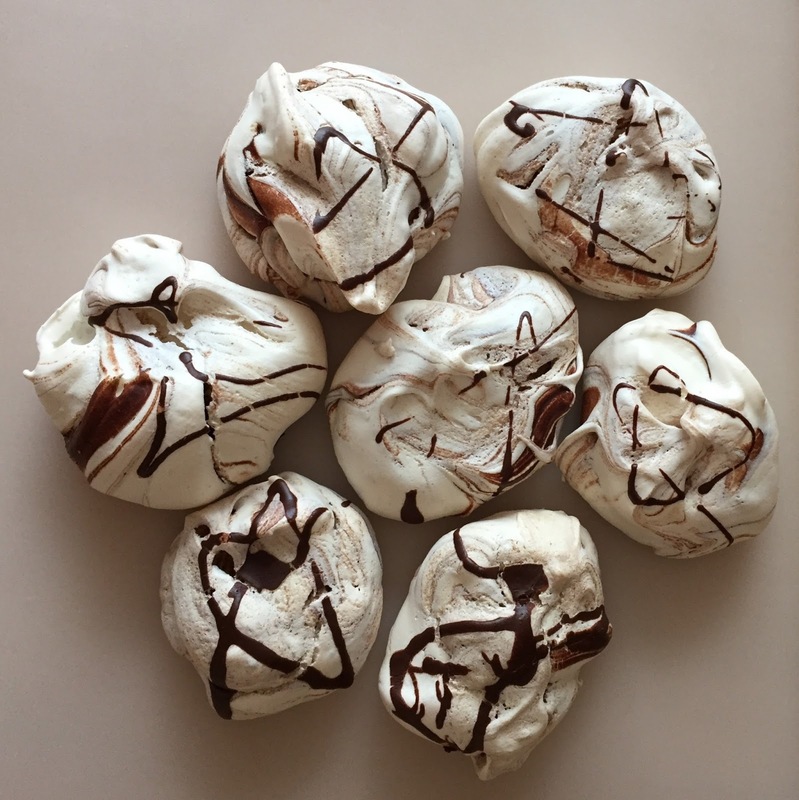 These meringues are roughly 8 cm, but you can make a lot more meringue kisses for fun. I melted 100g dark chocolate in the microwave for 12 meringues. It's up to you how chocolatey you would like your meringues. 1. Preheat the oven to 130°C, (fan 110°C). 2. Get a really clean medium bowl. If it is not spotlessly clean, it may mean that the egg whites don’t whip up properly. This goes for all the equipment. 3. Tip the egg whites into the bowl, squeeze the lemon juice in and then whisk to a medium peak. 4. Next add a spoonful of the sugar to the meringue and whisk really hard until all of the sugar has ‘dissolved’ and the mixture starts to look a bit shiny. Then add the remaining sugar gradually, while whisking all the time, until the mixture becomes really shiny and very stiff. 5. Finally, whisk in the cornflour for a second or two until smooth. This gives the meringue a marshmallow texture inside. 6. Drizzle the melted chocolate and gently fold the mixture. Don't "mix" it, but make a "marble" like pattern with the chocolate. Dollop blobs of the mixture onto the oven proof paper. 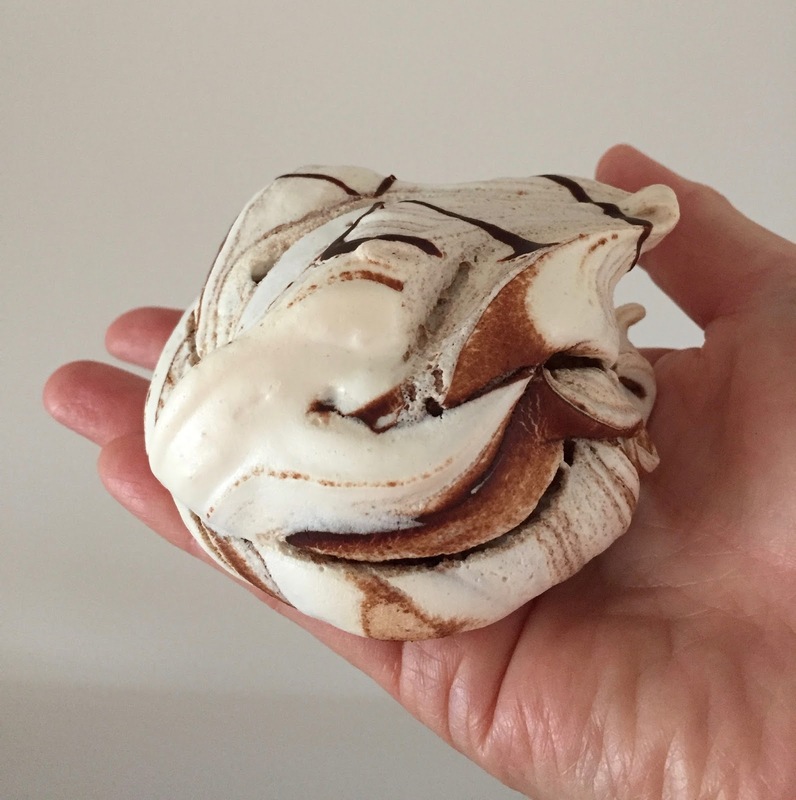 You can drizzle more melted chocolate on each meringue at this stage. 7. Bake in the oven for at least 40 minutes. Cool in the oven with the door ajar for at least 2 hours. 8. 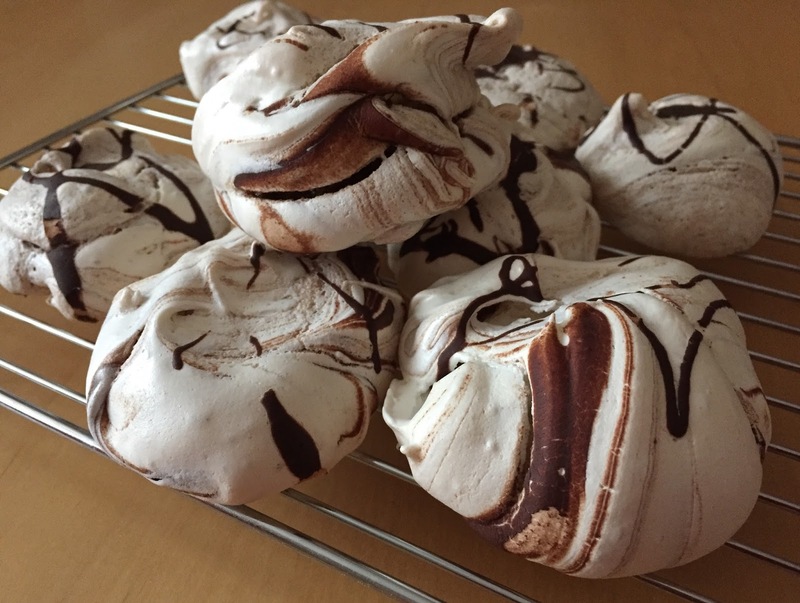 Once the meringues are ready, remove them from the oven and allow them to cool.